What is shortening? What are shortening substitutes? What is shortening? What are some shortening substitutes? Can I use butter instead of shortening? I get these questions all the time. Mostly the questions come from non-American readers, but sometimes my US readers also want to know if they can substitute something for shortening. However, most of my US readers just want to know if they can use butter in place of shortening. First off, I’m not a food scientist or culinary graduate. So I’m going to tell you what I know completely from a home baker’s point of view. Technically, “shortening” is any fat that is solid at room temperature and used for baking, pastries, etc. This includes butter, margarine, lard (animal or plant-based), or other fats (according to Wikipedia). But for the purpose of today’s post, I’ll say this: when I refer to shortening in any of my posts, I’m talking about vegetable shortening. 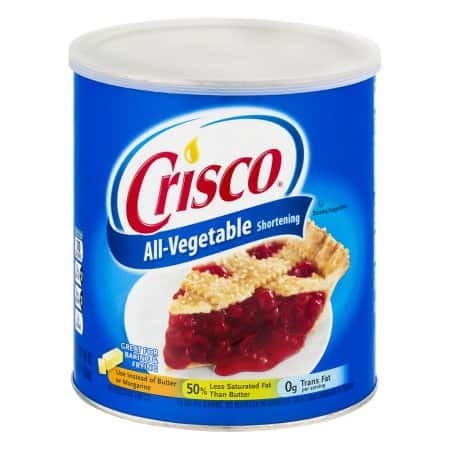 The most well-known brand in the United States is Crisco and it’s my brand of choice for all of my baking and frosting-making! There are other brands available, but in my experience Crisco is superior and it’s the only brand I use! Generally speaking, here in the USA, “shortening” has come almost exclusively to mean hydrogenated vegetable oil. Specifically, Crisco’s ingredients are soybean oil, full hydrogenated palm oil, palm oil, mono and diglycerides, TBHQ and citric acid. It’s a semi-solid fat with a higher melting point than butter or margarine. For us cake decorators, that means if you use it in frosting, it won’t melt as quickly as butter-based frosting. Also, it doesn’t require refrigeration. I did a little research and it seems that in other parts of the world, there are similiar products. Some names I found are Trex, Sweetex, Flora White, Copha or Cookeen. From what I can gather, these could possibly be substitutes for shortening. However, I do not have any personal experience with these products so I cannot speak with certainty. One other thing I should mention – high ratio shortening. For the longest time, I’d only heard of this product but never used it. Why? It’s not readily available where I live and it’s more expensive. Also, it’s even more expensive to have it shipped, so double-whammy. But I kept hearing it talked about in cake circles everywhere so I finally bit the bullet and ordered some. Here’s my take. First, is it a better product? Maybe. My buttercream did seem smoother and creamier when using the high ratio shortening. However, after trying it, I came to the conclusion that the slight improvement in texture did not outweigh the extra costs. I live in rural Mississippi and I’m already charging more for cakes than most of my competitors. If I add an expensive ingredient to my recipes, I have to raise my prices again and I’m not sure my clients would tolerate another price increase. Besides, I’m not convinced that the difference is all that noticeable for the general public. I taste buttercream all.the.time so I did notice the texture difference. But would my family or friends or clients? Probably not. However, for those of you who can get your hands on high ratio shortening without having to pay exhorbitant shipping costs, it may be worth it for you. At the very least, order a small containter of it and give it a try. Then you can draw your own conclusion. 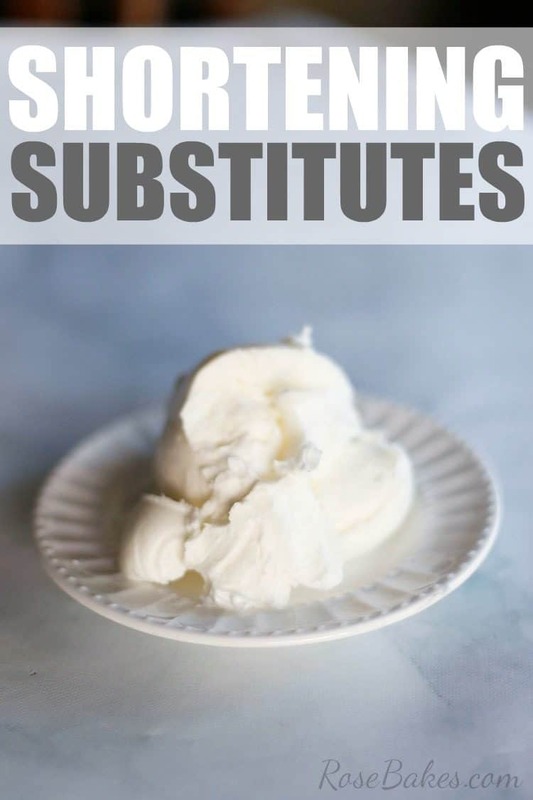 Other than actual shortening substitutes… let’s talk about swapping shortening for butter. So if you’re looking at any of my frosting recipes, I usually use some butter and some Crisco shortening. I feel like the combination gives the fantastic flavor of butter but the stability of shortening. I should note, I stick to American Buttercream for all of my orders, no Swiss or Italian Meringue Buttercreams here. 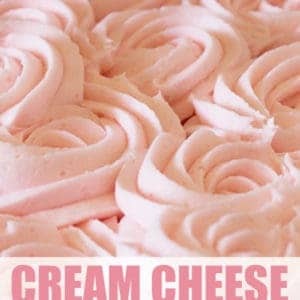 My most popular recipes are vanilla buttercream, chocolate buttercream and this cream cheese buttercream. I’d say 99% of the time, you could use all butter in these recipes, but there are things to consider. If you choose to use all butter instead of some portion of shortening, the frosting will be softer. It will melt (wilt, sag) faster if your cake is in a warm room or outside. It will not be as stable at warmer temperatures. Piped buttercream will not hold it’s shape as well outside of the refrigerator. I’m not saying it’s always going to be a puddle or anything like that… but it will be softer. Think of it this way: shortening at room temp is still solid. Butter at room temp becomes quite soft. Your frosting will reflect those differences depending on what you use. If you use all shortening – it will hold it’s shape really well. On the other hand, if you use a mixture of shortening and butter, it will also hold up pretty well. But if you use all butter, it will soften and not hold it’s shape as well. 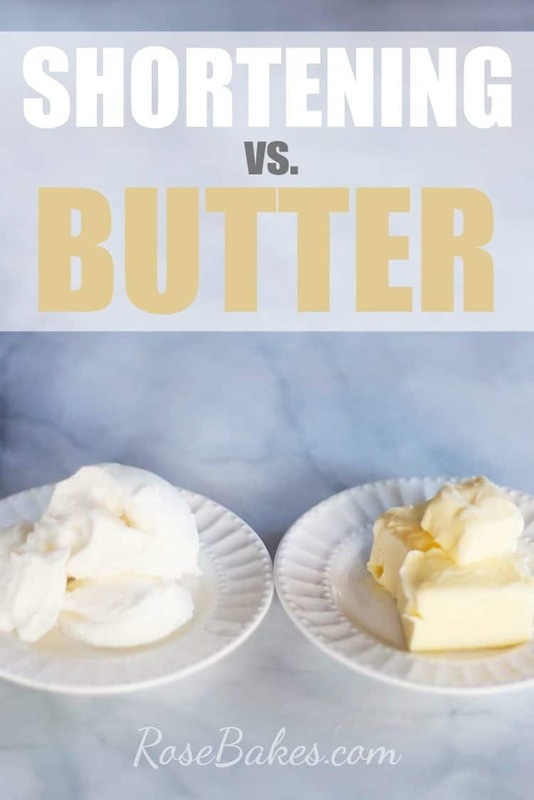 To be clear, this is what I’m talking about: if the recipe called for 1/2 cup butter and 1/2 cup shortening, you could use 1 cup of butter instead for a softer, shortening-free version. You can also substitute butter for shortening in baked goods, but sometimes there are also noticable differences. Shortening is 100% fat. 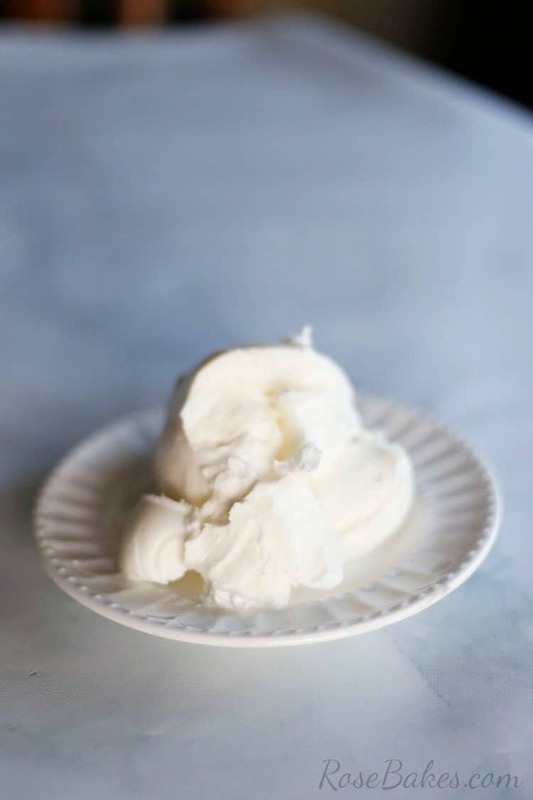 Butter has some water content – usually around 85% fat and 15% water (this varies slightly from brand to brand). 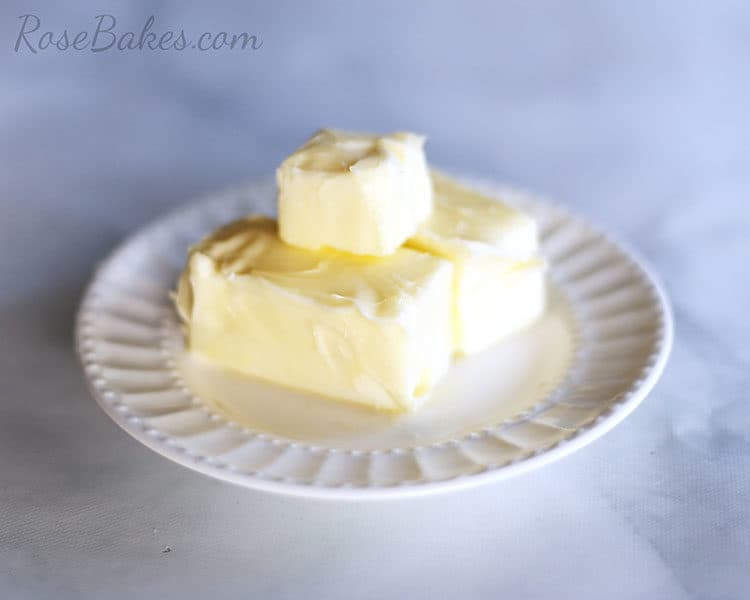 When baking, the extra water content in butter may alter the consistency, flavor and/or texture of your baked goods. 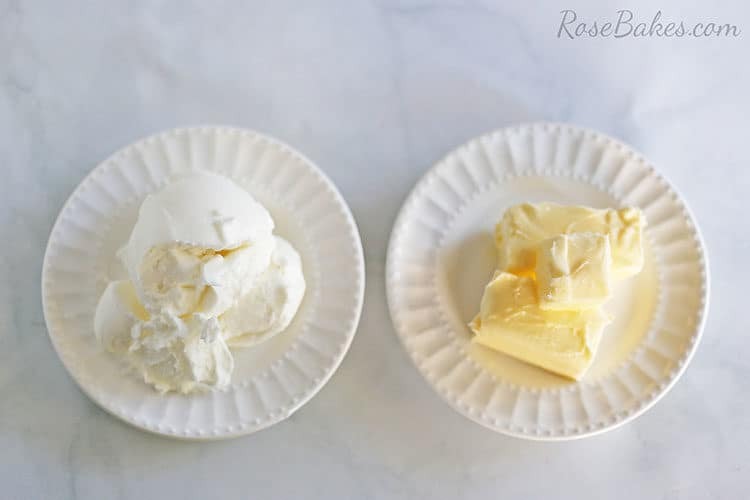 With the lower melting point of butter, if you use butter instead of shortening when baking, your cookies will spread out more and be softer. 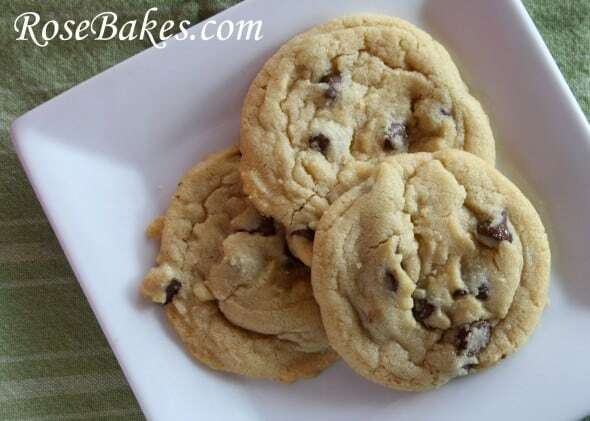 I use both butter and shortening in our favorite chocolate chip cookie recipe and they are divine! I don’t think the substituion would be as noticeable in cake, other than a slight texture difference. But then again, I rarely test that theory. These petit fours for example… perfection! I wouldn’t swap the shortening for butter quite simply because I don’t want to mess up a good thing! Also, your pie crusts will not be as flaky. I don’t know why, I just know it’s true. I know shortening sometimes gets a bad rap, but these are not all bad things! They are just differences you should be aware of if you make a change to a recipe. And I think that’s it! I hope I have answered your questions. Do you have any other knowledge to add to this discussion? Or other questions? Leave me a comment! I have just started to bake cakes and cup cakes. When I use shorting the frosting had a taste os shorting. How do I make that not happen. Hi Rose, cookie Gift Can Queen sells Sweetex Hi-Ratio shorting on Etsy for home bakers in small quantities for professional tasting icing. Just wanted to share with my fellow bakers. Great post. I personally can’t deal with Crisco it melted as I was piping it. Where the Sweetex doesn’t do that . The taste is amazing I think you should give it another try there really is a difference. Can lard be substituted for high-ratio shortening? I would not make that substitution. I have a gingerbread recipe that calls for 1 cup of shortening. It’s not really widely used here in New Zealand for baking as we are a very dairy-oriented country. I’m thinking I might try the 50/50 version. We also prefer our cookies crisp. I have used lard for a soy and dairy allergic client. I did not like the taste, but the family loved it. I also used “Spectrum”, an organic, soy free item. It was a little drier and I added more liquid. I have used coconut shortening sticks – very expensive. Some are flavorless and some have a coconut taste. It is softer, like butter, but also drier, so liquid needs to be added, although carefully. One more item I have used is a vegan “butter”. It acts much like butter in icing and baking. It has a slight coconut flavor that is undetectable in icing or baked goods. I also agree that regular shortening makes the best pie crusts – Crisco all the way!